Without trying to sound too dramatic, one of the most fulfilling yet heartbreaking relationships I have been in is the one between me and my bed. And don’t act like I’m crazy, because I know you’re all going through the same thing too. In fact, if you don’t immediately miss your bed and bed covers 0.5 seconds after you get up then I need to know what you do for a living ASAP. Unless you’re some sort of “influencer”, because in that case please stay far, far away from me. Anyway, all I’m trying to say is that it is a pretty common problem that I truly believe most (normal) people have. 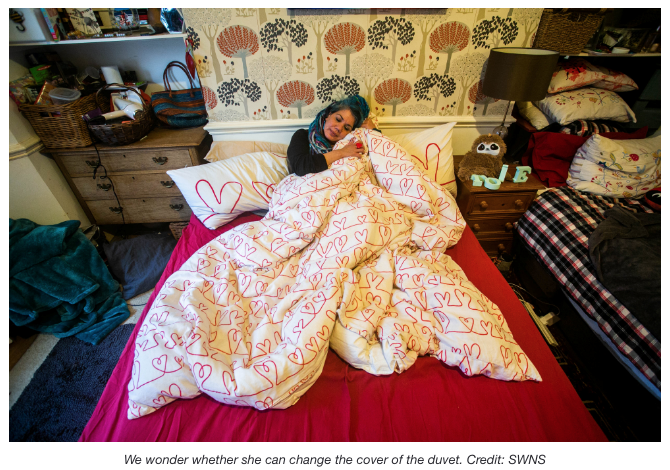 Unless you happen to be Pascale Sellick, that is, and have just announced to all your nearest and dearest that you’ll be planning a very lavish ceremony in which you tend to legally marry your actual bed covers. 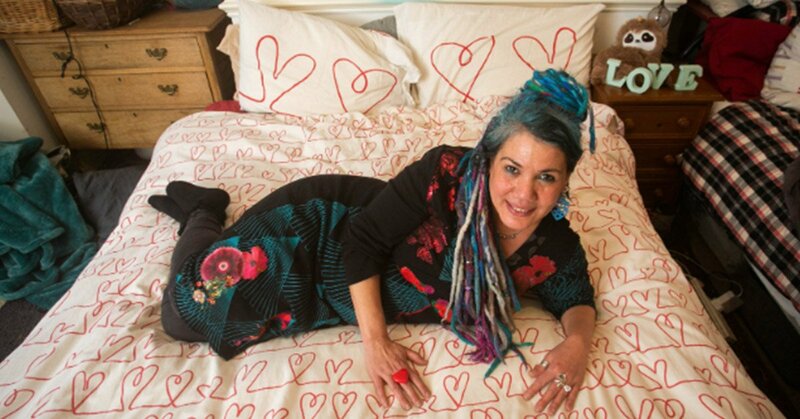 The 49-year-old has officially sent out invitations to literally anyone who wishes to attend such a ceremony in order to witness the moment she very publically declares her love for the thing she adores cuddling up with most during those long winter nights. 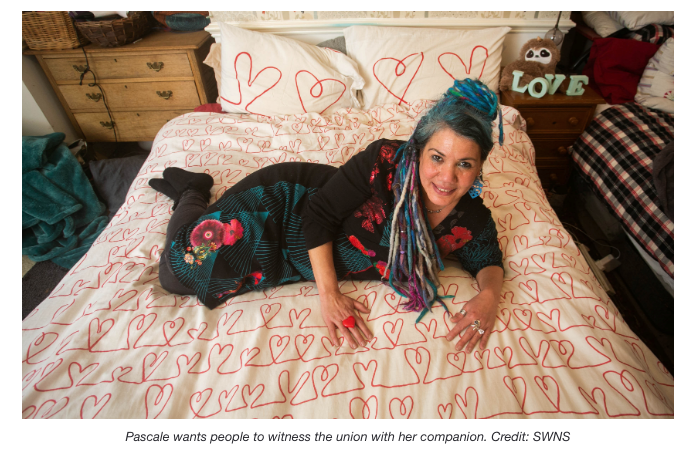 Pascale, who is an artist, describes herself as a ‘rude, crude, spectacular exhibitionist’ – and honestly the first time I read that I thought I was reading a description of myself. 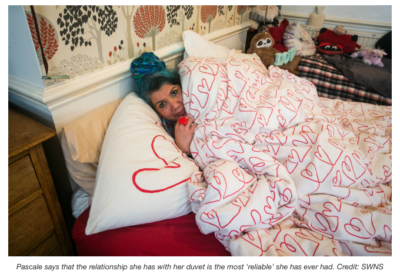 She also goes as far to describe her comforter as the ‘most intimate and reliable relationship’ she’s ever had. 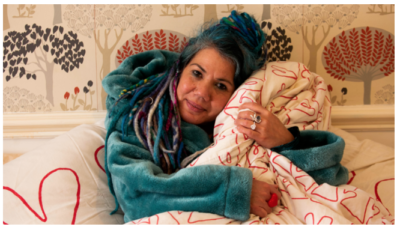 This somewhat unusual ceremony will allegedly be held in Exeter, Devon, the UK at the Rougemont Gardens on Sunday 10th February at 2 pm… if you’re interested in taking her up on her invitation. It’ll then be followed by a ‘free wedding party’ at The Glorious Art House in Fore Street. And yes, full vows WILL be read. This will happen in front of a fellow artist who has no religious affinity and is also performing the entire ceremony for the happy couple. Soooo sweet. Alas, if all that still hasn’t piqued your interest in attending, perhaps the dress code will; Sellick has requested that all guest wear dressing gowns, pajamas, onesies, and slippers… with the added option of also bringing along teddy bears and hot water bottles. To be fair that’s what I’m usually wearing on a Sunday anyway, so it’s not like I’d have to make a massive effort if I went. And what will 1/2 of the guest of honors be wearing? Well, for now, Pascale is keeping the comforters formal attire for their big day is being kept as a surprise… but you know I’ll be searching the freakin’ web for photographs on Monday 11th February.. However, she has revealed that her outfit will include fluffy slippers and nightgown, topped off and obviously complemented by a dressing gown. But that’s not all! At the after party, there will, in fact, be a wedding band (do you think the band knows what type of ceremony they’ll be performing at?? ), speeches and the traditional cutting of the wedding cake. And the craziness doesn’t stop there, either. In order to ENSURE that this will be the most magical day of her life, Pascale has even hired Anna Fitzgerald, who runs WooHoo Art Events, as her official wedding planner. “This is the most out-there art happening to date. I’m really pleased to be involved. Valentines day can be depressing for lots of people so hopefully this will lift peoples’ spirits. Wait so, I’m confused… is this just art or an actual wedding? Personally, I think it’s an excuse… true love covered up to look like a mere art installation, personally. Yep, that’s what I’m going with, and if you think I’m wrong then fight me. Either way, many congratulations to the happy couple! Hopefully, your many years together will provide with love, laughter, and many great nights sleep!